All'Alba with François Carrier, Michel Lambert, Pierre Côté and Uri Caine. Recorded at Studio Victor, Montreal, Quebec, Canada on November 23 and 24, 2001. French Canadian alto saxophonist Francois Carrier has made a career out of being unpredictable. All’ Alba, his latest CD, is yet another pleasant surprise. The surprise here, however, is not Carrier’s melodic inventiveness, nor is it bassist Pierre Cote and drummer Michel Lambert’s highly sympathetic vibrations. In this case, the surprise is the welcome addition of adventurous pianist Uri Caine to Carrier’s usual lineup. Carrier’s alto is rough and sinewy, as always. His sheer brawn as a soloist belies the alto’s lighter sound (it’s interesting to compare Carrier to someone like Paul Desmond, in whose hands the alto sounds like a completely different instrument). Cote’s sound is fat and round, resonating with Carrier’s sandpaper tone. Lambert, as always, is exceptional on drums.But it is American citizen Caine who is the real show here. He doesn’t just support Carrier, he engages him. To listen to the two of them circle one another on tracks like “Lekh Leka” and “Karuna” is incredible. In Caine, Carrier has surely met his match. But, as Duke Ellington once noted of his Stride heroes, these two musicians respect one another too much to draw blood. This is a knock-down, drag-out musical melee in which everybody wins, especially the listener. Track Listing: Karuna; Entrance 3; Lekh Leka; Enfants du Ciel; L’Etang; Don’t Mind; Jeu; As Crazy As; All’ Alba. Personnel: Francois Carrier, alto saxophone; Uri Caine, piano; Pierre Cote, bass; Michel Lambert, drums. 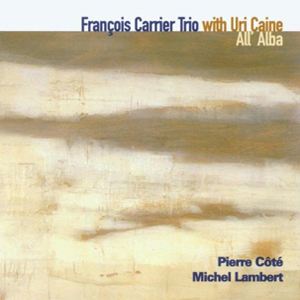 This latest offering from alto saxophonist Carrier and his trio is an eclectic and complicated set of originals, and who better to join them than the unfailing versatile and nimble pianist, Uri Caine? Playing material that ranges in tenor – sometimes within single pieces – from straight-ahead lilt to the distant regions of the most outside, Caine proves an engaging complement to the far-reaching trio.Two of the tracks on the album are credited to Carrier but are entirely improvised exercises, .”Enfants du Ciel” and “Jeu”. The former, the longer on the two, features intriguing elements from each of the four improvisers but ultimately comes off perhaps a little too erratic, with little emphasis on thematic unity. The shorter “Jeu” is more directed, less given to affected meandering. The group maintains a more controlled chaos, offering a thorny collective investigation that doesn’t sacrifice mutual sensitivity.The quartet’s inclination toward the (so-called) avant-garde in combination with its alternate ability to play melodically, over changes, produces a satisfying contrast as the set progresses. The oblique “Enfant du Ciel” gives way to more grounded groove of “L’Étang”, a mid-tempo number that offers a lively, protean solo from Carrier and intricate, agile comping from Caine. The tune’s theme is lovely, as is the chart for the charming waltz, “Don’t Mind”, which follows it. In these more centered moments the quartet hit their highest points, channeling the exploratory impulse into a disciplined but complex group performance. A telling example is the album’s opener .Karuna”, which turns a conventional 1960s modal feel into something more demanding, as Carrier’s alto blares like a siren over the rhythm section’s shifting platform. Bassist Pierre Côté is particularly noteworthy on the track, shaking up the pulse with a line that is by turns staggered and speeding, a move that aggressively pushes and pulls his colleagues over the beat. Caine achieves a similarly disruptive effect with his solo on “Lekh Leka”, tumbling into a manic, out-of-time stride that hints at tradition as it works to subvert it. It is but one moment out of many here that showcase this ensemble’s genius for alchemy and its facility for playing against the grain.